The destroyers USS Selfridge and O'Bannon at Nouméa after the battle. The Battle of Vella Lavella (第二次ベララベラ海戦, Dainiji Berarabera kaisen) was a naval battle of the Pacific campaign of World War II fought on the night of 6 October 1943, near the island of Vella Lavella in the Solomon Islands. 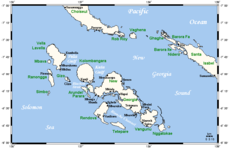 It marked the end of a three month fight to capture the central Solomon Islands, as part of the Solomon Islands Campaign. The battle took place at the end of the ground campaign on Vella Lavella, as the Japanese sought to evacuate the 600-strong garrison from the island. The garrison had become hemmed into a small pocket on the northern end of the island around Marquana Bay. While a force of around 20 auxiliary ships and barges evacuated the stranded soldiers, a force of nine Japanese destroyers fought a short, but sharp engagement with six US Navy destroyers to the north of the island diverting attention from the evacuation. As a result of the engagement, the Japanese evacuation effort was successfully concluded. Each side lost one destroyer sunk. After their defeats on New Georgia and in the Battle of Vella Gulf, the Japanese had evacuated their garrisons in the central Solomons. A staging post had been established at Horaniu on the north coast of Vella Lavella for the evacuation barges. Allied troops from the US and New Zealand had landed on Vella Lavella in mid-August and had subsequently cleared the coastal areas, pushing the Japanese towards the northwest shore. The barge depot around Horaniu was captured by US forces, and by early October 1943, only 600 Japanese soldiers remained. The garrison was hemmed into a small pocket around Marquana Bay, where they were surrounded by troops from the New Zealand 14th Brigade. Following the evacuation of Kolombangara (the next major island in the New Georgia chain, to the southeast) the Japanese decided to withdraw the troops stranded on Vella Lavella. On 6 October, an assortment of 20 auxiliary ships (including subchasers, barges and other small vessels) under Captain Shigoroku Nakayama, was dispatched from Buin, on Bougainville Island, to rescue them. A force of three older destroyer-transports—Fumizuki, Matsukaze, and Yūnagi—escorted by six modern fully combat-ready destroyers—Akigumo, Isokaze, Kazagumo, Yūgumo, Shigure, and Samidare—was dispatched from Rabaul under Rear Admiral Matsuji Ijuin to cover the evacuation. On the evening 6–7 October, the Japanese destroyer force under Ijuin, was cruising northwest of Vella Lavella. Earlier, Ijuin had detached the three destroyer-transports along with Shigure and Samidare to proceed towards Marquana Bay. At 22:30 they spotted a U.S. force of three destroyers—Selfridge, Chevalier, and O'Bannon, commanded by Captain Frank R. Walker—approaching from Vella Gulf. A second division of three U.S. destroyers—Ralph Talbot, Taylor, and La Vallette—under Captain Harold O. Larson, had been detached from convoy duty further south in the Solomons with orders to join up with Walker. These three additional ships were making speed up the west coast of Vella Lavella towards his division. Shigure and Samidare subsequently sought to rejoin the four destroyers under Ijuin, who began battle preparations, while the three destroyer transports began to retire towards the Shortland Islands. 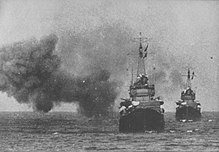 Walker did not wait for the three destroyers under Larson to come up, however, and attacked immediately. Both sides launched torpedoes and opened fire at about 23:00. A tactical error by the Japanese commander resulted in his force losing the initial advantage and placing them at close range along the US ships' line of fire. Yūgumo, first in the Japanese line, after charging the US destroyers and firing several torpedoes was hit several times, knocking out her steering. She was finished off by a torpedo and sunk at about 23:10. However, one of her torpedoes hit Chevalier, detonating the forward magazine. O'Bannon then collided with the crippled Chevalier, and for some time the two ships were locked together. Selfridge attacked alone, firing at both Shigure and Samidare, but was hit by a torpedo at 23:06 and disabled. All three ships were severely damaged, and reinforcements were still 15 minutes away. However, the rest of the Japanese force turned away, after patrol aircraft misidentified the three approaching US destroyers as cruisers. Ijuin ordered his force, and the destroyer transports to withdraw back towards Rabaul, while the auxiliaries completed the evacuation. Shigure and Samidare off Bougainville just hours before the battle. Larson's destroyer division arrived on the scene around 23:35, and subsequently began searching for the departing Japanese destroyers, briefly picking up a radar contact on Yugumo as she sank. Shortly after midnight, Larson began rescue operations. Wounded were cross loaded from Chevalier and the crippled ship was scuttled around 03:00 with La Vallette firing a torpedo into Chevalier's magazine and then destroying her bow with depth charges. Selfridge and O'Bannon, however, despite being heavily damaged, remained afloat and were subsequently withdrawn for repairs. The Japanese completed their evacuation mission, with Nakayama's force entering Marquana Bay around 01:10 while American attention was focused on the recovery and departing two hours later, withdrawing 589 troops to Buin, on Bougainville. Casualties during the battle amounted to 67 killed, 47 wounded and 36 missing for the Americans. Of these, 54 were killed on Chevalier and 13 on Selfridge. Thirty-six were wounded on Chevalier and 11 on Selfridge. All missing were from the Selfridge. The Japanese lost 138 killed, with about 25 crew being rescued by boats from O'Bannon, and another 78 by US PT boats. The Allies had captured the central Solomons after a three-month campaign. It cost the Allies six ships for seventeen lost by the Japanese. This naval battle ended the second phase of Operation Cartwheel – the plan for the reduction of the main Japanese base at Rabaul. ^ a b "Chevalier I". Dictionary of American Naval Fighting Ships. Archived from the original on 3 March 2013. Retrieved 12 August 2017. ^ a b c d "Selfridge". Dictionary of American Naval Fighting Ships. Archived from the original on 2 February 2013. Retrieved 12 August 2017. ^ a b Nevitt, Allyn D. "Yūgumo". Long Lancers. Retrieved 12 August 2017. ^ Morison, Breaking the Bismarcks Barrier, p. 233. ^ Morison, Breaking the Bismarcks Barrier, pp. 239 & 251. ^ Miller, Cartwheel: The Reduction of Rabaul, pp. 172–175. ^ Kolombangara is between New Georgia and Vella Lavella. As the Allies secured New Georgia, they bypassed Kolombangara and landed at Vella Lavella. ^ Morison, Breaking the Bismarcks Barrier, pp. 242–244. ^ Nevitt, Allyn D. "The Battle of Vella Lavella". Long Lancers. Retrieved 12 August 2017. ^ Morison, Breaking the Bismarcks Barrier, pp. 245–246 & 250. ^ Morison, Breaking the Bismarcks Barrier, pp. 244–249. ^ Morison, Breaking the Bismarcks Barrier, pp. 247–248. ^ Morison, Breaking the Bismarcks Barrier, pp. 248–250. ^ a b Morison, Breaking the Bismarcks Barrier, pp. 250–251. ^ "O'Bannon II". Dictionary of American Naval Fighting Ships. Archived from the original on 1 February 2013. Retrieved 12 August 2017. ^ Morison, Breaking the Bismarcks Barrier, p. 251. Miller, John, Jr. (1959). Cartwheel: The Reduction of Rabaul. United States Army in World War II: The War in the Pacific. Office of the Chief of Military History, U.S. Department of the Army. Retrieved 20 October 2006. Morison, Samuel Eliot (1958). Breaking the Bismarcks Barrier, vol. 6 of History of United States Naval Operations in World War II. Castle Books. ISBN 0-7858-1307-1. Brown, David (1990). Warship Losses of World War Two. Naval Institute Press. ISBN 1-55750-914-X. Hone, Thomas C. (1981). "The Similarity of Past and Present Standoff Threats". Proceedings of the U.S. Naval Institute. Annapolis, Maryland (Vol. 107, No. 9, September 1981): 113–116. ISSN 0041-798X. McGee, William L. (2002). "Occupation of Vella Lavella". The Solomons Campaigns, 1942–1943: From Guadalcanal to Bougainville—Pacific War Turning Point. Volume 2: Amphibious Operations in the South Pacific in WWII. BMC Publications. ISBN 0-9701678-7-3. Roscoe, Theodore (1953). United States Destroyer Operations in World War Two. Naval Institute Press. ISBN 0-87021-726-7. Wikimedia Commons has media related to Naval Battle of Vella Lavella. This page was last edited on 7 April 2019, at 00:12 (UTC).